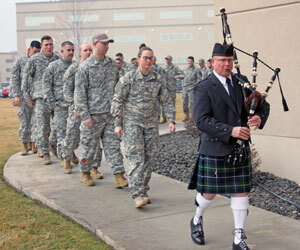 It was an overcast, drizzly day when I played the Scottish Highland bagpipes this morning for Cpl. Garrett Farrelly's interment service at Mountain View Cemetery in Walla Walla, Washington. Highland Cathedral was played as family and friends gathered. The Marine Corps Hymn and Taps were played during the service. Going Home was played to end the service. I played Scottish Lowland bagpipes, tenor mandola, and whistles this evening with Celtic band Skweez The Weezle at Tommy's Tap House & Bistro in Richland, Washington. We had a great crowd, as usual, at Tommy's. It was an awesome time! I played Scottish Lowland bagpipes, tenor mandola, and whistles this evening with Celtic band Skweez The Weezle at the Towne Crier Restaurant and Lounge in Richland, Washington. It was a great time! I played Scottish Lowland bagpipes, tenor mandola, and whistles this evening with Celtic band Skweez The Weezle at RF McDougall's Irish Pub and Eatery in Richland, Washington. I played Scottish smallpipes, tenor mandola, and whistles with Celtic band Skweez The Weezle today at Whitman Place Assisted Living in Walla Walla, Washington for their St. Patrick’s Day celebration. I played Scottish Lowland bagpipes, tenor mandola, and whistles with Celtic band Skweez The Weezle today at Richland High School in Richland, Washington for a student Cafe Night. Former band member Dawn Gordon stopped by to play fiddle during several sets. 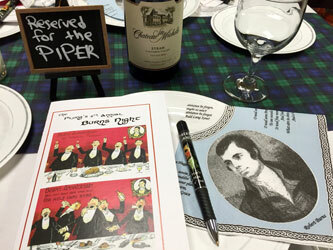 I played the Scottish Highland bagpipes and penny whistle at the Plungs' 8th Annual Burns Night dinner in West Richland, Washington. I played a selection of tunes to start the evening off right. Tunes included Scotland the Brave and Murdo's Wedding; Drops of Brandy and The Foxhunters Jig; The Battle of Waterloo and The Gravel Walk; Lament for Red Iain and Amazing Grace; The Mill The Mill O' and The Bonny Lass of Fyvie; and Farewell To the Tay and The Atholl Highlanders. The haggis was piped in with Lord Lovat's Lament, and out with Loch Ruan. I played whistle to accompany Pat Patterson as he led guests singing Skye Boat Song, Loch Lomond, and Auld Lang Syne. I played Scottish Highland bagpipes this morning for Patrick Donnelly's Graveside Service at Waitsburg City Cemetery in Waitsburg, Washington. Amazing Grace was played to end the service. This morning, I played Scottish Highland bagpipes for the Hanford Patrol Officers Graduation Ceremony at the MSA Atrium in Richland, Washington. I piped the graduates into the ceremony playing Lord Lovat's Lament.